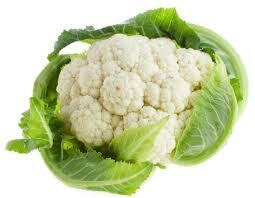 As its name implies, cauliflower is actually a flower. The part of the plant that we eat is the flower or "head" with the stem and leaves found underneath the base of this giant bud. By the time the odd flower reaches the grocery store, the leaves have been trimmed off and so is most of the stem.